My child loves baby dolls. We always seem to have several underfoot. Including this one. 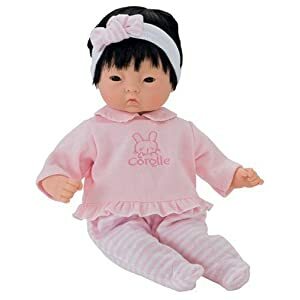 I like the Corolle dolls. They are pricey so I would never buy one, but I won’t say no to hand-me-down ones. Usually by the time we get them, they don’t have any clothing or accessories, so I need to make some things for them to wear. Here is a super simple knitted cap for this size doll. 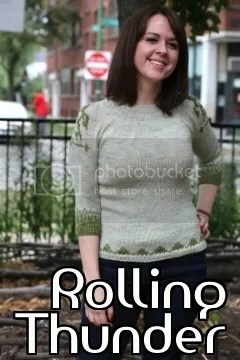 It’s a little tight, because I used superwash wool and I would expect that it will end up stretching over time. The yarn color is my preschooler’s first attempt to dye yarn by herself. Materials: Small amount (about 20g / 40 yards) of superwash wool or acrylic worsted weight yarn. Cast on 48 stitches and join in the round. If using DPN’s, cast on to one needle and then divide on to 3 needles (16 stitches each). Once the i-cord is approximately 2 in / 5cm long bind off as follows: k2tog, k2tog, slide work to other side of needle, knit last two stitches together, cut a short tail for weaving in and pull yarn through last stitch. Weave in ends and tie i-cord into a jaunty top knot. 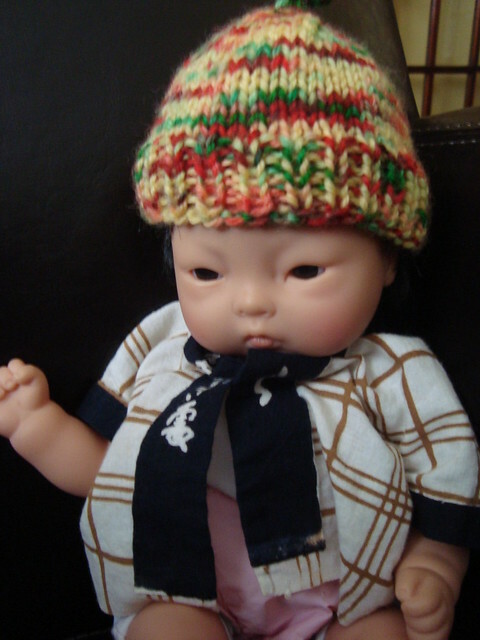 This entry was posted in Patterns and tagged doll, hat. Bookmark the permalink.